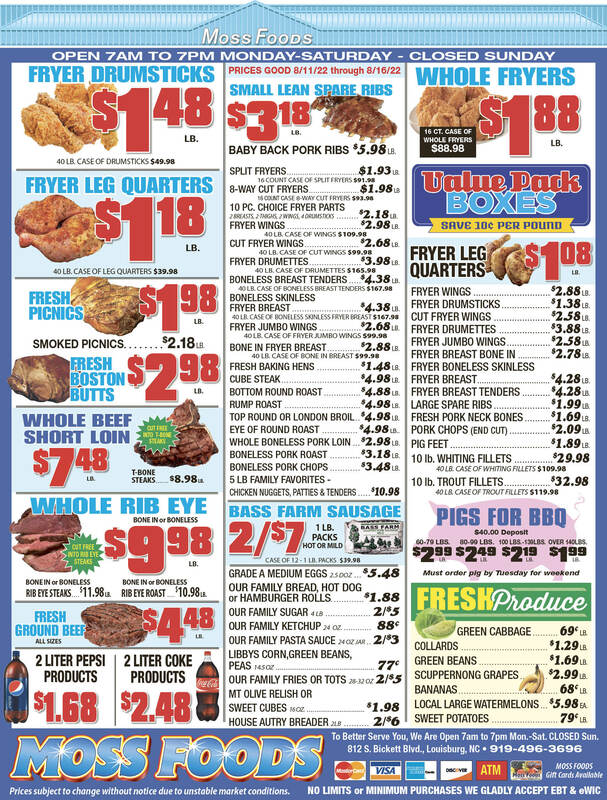 Showing 53 articles from September 4, 2013. BIRD’S EYE VIEW. 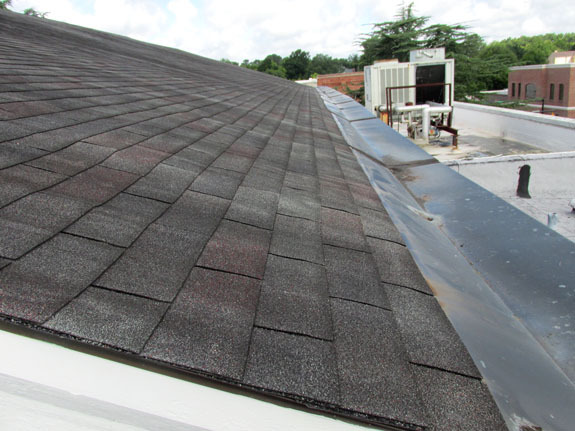 Above, a photo shows the waves evident in one portion of the roof above the county courthouse. LOUISBURG — Franklin County commissioners took two actions they anticipate will bolster two venerable buildings. First, the board gave finance staff the approval to file an application with the Local Government Commission (LGC) to borrow up to $3 million — money that would be used to renovate the jail and rehabilitate the courthouse. Then, the board agreed to engage the services of Surapon Sujjavanich to solicit bid proposals for repairs needed at the courthouse. Charges have been dropped against a Louisburg man implicated in a triple shooting. And Richard D. Williams said charges against a co-defendant should be dropped, as well. Deputies arrested Williams on Aug. 21 — four days after they allege he and Noel A. Matthews shot three people following an altercation at a house party on Bailey’s Creek Drive. With fall officially just around the corner — and cooler, less humid days making it seem even closer, it’s time for high school football in Franklin County. 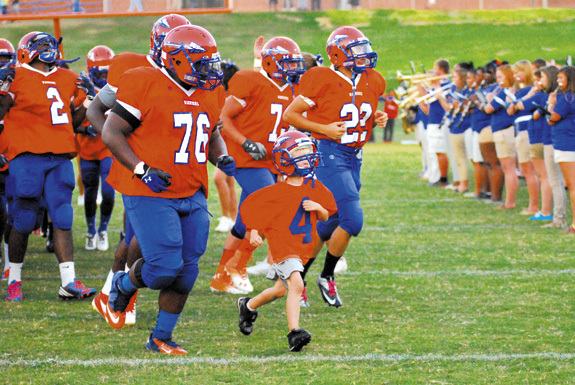 In the photo above, young Winston Lee leads the Louisburg High School Warriors — which are coached by his dad, Chris Lee, onto the field before last Friday night’s game. LOUISBURG — Drug charges against a Granville County teacher have been dismissed. Anthony W. Coghill said he’s been reinstated by the school system and he’s been absolved by the court system. “It feels good to be vindicated,” Coghill said this week. His matter was adjudicated by prosecutors in Franklin County Superior Court on Aug. 28. The newly created Tar River Center for History and Culture (TRCHC) at Louisburg College will sponsor two public events this month. On Thursday, Sept. 19, the center will host a strategic planning session at 7:30 p.m. in the Louisburg Training Center of the Police/Fire Complex (located off of Wade Avenue in Louisburg). Franklin County’s workforce grew in July while ranks of the unemployed dropped a bit. The result was that Franklin County joined 80 other North Carolina counties in reporting a drop in the unemployment rate for the month. Franklin County registered an unemployment rate of 8.4 percent, down from 8.6 percent in June. 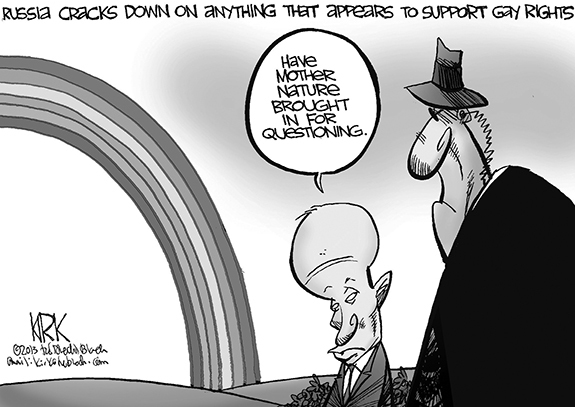 Does fuzzy crystal ball show trash dump in our future? Could there be a mega-dump in Franklin County’s future? Some signs are suggesting another effort to locate a huge landfill in Franklin County. Worse, the political forces available to fight this effort, unlike the past two times, may not be available. For those of you who may be new to Franklin County, it’s important to know we’ve been targeted for one of the mega-dumps — huge landfills of up to 1,000 acres — twice in the last 20 years. The political games, that is. The ones played out on a world stage with life-and-death consequences. As the world tries to figure out how to respond to Bashar Assad, Syria’s brutal dictator, in the wake of his inconceivable decision to use poison gas on his own people, a sub-plot here in the United States will be fascinating to watch. One of the best things about the show is its continuity which, going on eight years now, is pretty impeccable. It’s even more incredible when you consider the show’s plot devices, which feature flashbacks as well as flash-forwards. Before I continue with our current topic, I want to take a moment to remember a dear friend, Terry “Vi” McCane. She has slipped the bonds of this earth. Her smiling face and indomitable spirit brought joy to me, always looking for a way to help others, she never asked anything for herself. I will truly miss her. I think all the English majors became Republicans. 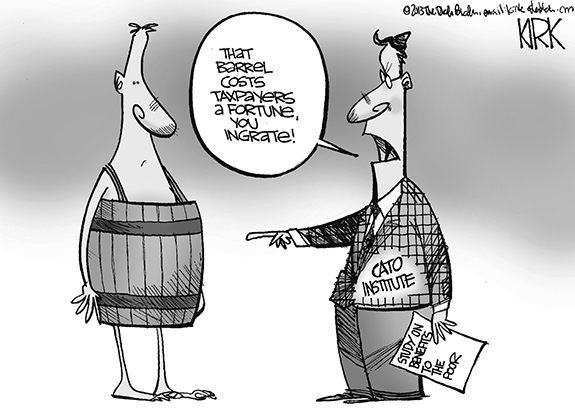 They certainly present an opportunity; just not for the poor and middle class children of Franklin County. I read with interest and excitement the Aug. 22 editorial page column, “Let’s give up lost cause, try something that works” about a path needed for local economic growth. Though I no longer live in Franklin County, I am a native of Louisburg and I continue to be interested in its progress and purpose. NASHVILLE - Funeral services for Baby Girl Faith Elizabeth Lopez, 26 days old, who died Friday, Aug. 30, 2013, were held Wednesday, Sept. 4, at Richardson Funeral Home in Nashville, with the Rev. Oscar Alvarez officiating. Burial was in the Four Square Church cemetery. SPRING HOPE - Gene Darvin Bryant, 75, died Monday, Sept. 2, 2013. Funeral service was held Wednesday, Sept. 4, in the Strickland Funeral Home Chapel, Wendell, with interment to be at 11 a.m. Thursday, Sept. 5, at Pine Ridge Baptist Church cemetery. NASHVILLE - Funeral services for Lewis Richardson, 67, who died Friday, Aug. 30, 2013, will be held at 2 p.m. Saturday, Sept. 7, at Richardson Funeral Home in Nashville, with Bishop Percy Silver officiating. Burial will follow in Oakland Cemetery. RALEIGH - Ronald Edward Doman, 64, died Saturday, Aug. 31, at WakeMed Hospital in Raleigh. Funeral services will be held at 2:30 p.m. Saturday, Sept. 7, at Falls Baptist Church, with the Rev. Dr. Terry Ashe officiating. Burial will follow in the Falls Community Cemetery. FRANKLINTON - Ruth T. Deal, 83, died Sunday, Sept. 1, 2013. Arrangements by Cutchins Funeral Home, Franklinton. ENFIELD - Funeral services for Tavares E. Evans, 27, who died Saturday, Aug. 31, 2013, will be held at 1 p.m. Friday, Sept. 6, at Pleasant Grove Baptist Church, with the Rev. Melvin Johnson officiating. 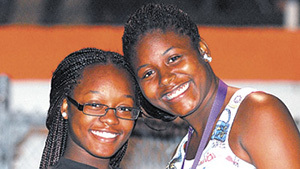 Burial will follow in the Evans family cemetery. FRANKLINTON—Viola K. McCane, 69, died Friday, Aug. 30, 2013. Funeral service will be held at 3 p.m. Thursday, Sept. 5, at Faith Baptist Church. Burial will be held in Georgetown, Ohio. DON’T PICK ON ME. Franklinton’s Trevor Hill returns an interception during a key play of the Red Rams’ road victory last Friday night at Louisburg HS. LOUISBURG - Franklinton’s sprinter’s speed proved to be too much for Louisburg during the marathon that was last Friday’s non-conference, backyard rivalry showdown. In an interesting contrast between offenses, Franklinton’s big-play abilities overpowered Louisburg’s tough, methodical scheme. TANGLED UP WITH YOU. 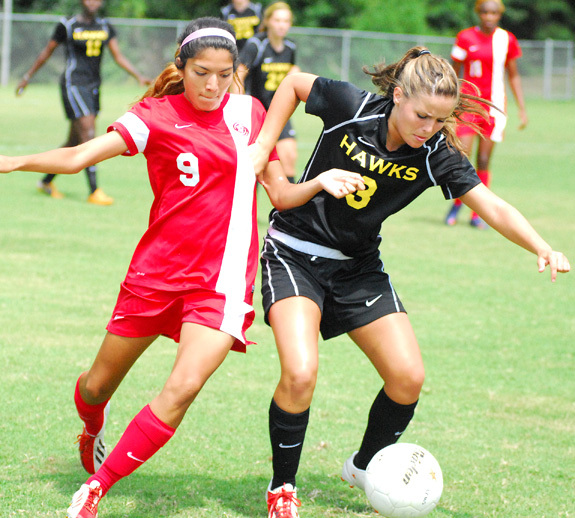 (L to R) Louisburg College’s Kim Olvera and Southern Maryland’s Jenn Foresta fight for the ball during last Saturday’s women’s soccer contest at Dr. Ronald May Field on the LC campus. LOUISBURG -- Louisburg College expended almost too much energy during its quick women’s soccer start last Saturday against the College of Southern Maryland. The Lady Hurricanes were hungry and active in the first half en route to building a 2-0 advantage. But as the depth-challenged LC squad began to tire, the liberally substituting CSM crew would rally after the break to stun the Lady Canes by a 3-2 tally at Dr. Ronald May Field on the LC campus. TOMMY TAKES IT UPFIELD. 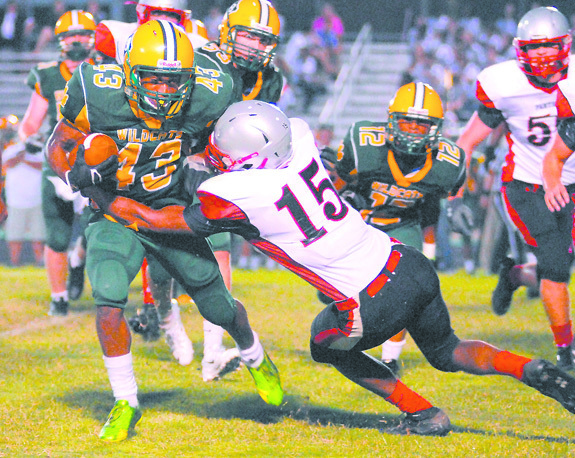 Bunn’s Tommy Evans (with ball) picks up yardage during the Wildcats’ home victory last Thursday against North Johnston. BUNN -- Bunn needed all of 15 seconds to squelch North Johnston’s hard-earned momentum en route to picking up the first victory of the David Howle Era Part Two. After taking a substantial lead for the second straight week, BHS saw the Panthers parlay a pair of late second-quarter touchdowns into just a seven-point deficit -- after the Wildcats had opened with 21 unanswered points. SLIP SLIDIN’ AWAY. Louisburg College return specialist John Whealey slithers through traffic during last Saturday’s home football victory over Virginia Beach Institute at the Old Franklinton High School. 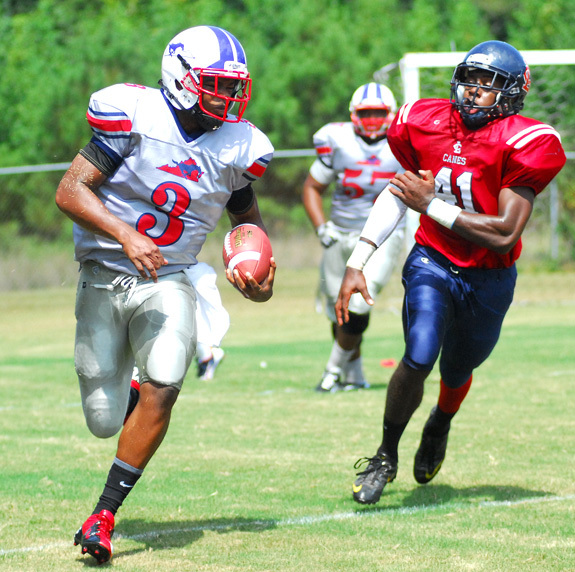 FRANKLINTON -- After working out a few early kinks, the Louisburg College Hurricanes had no problem rolling to a season-opening football victory last Saturday. The Hurricanes, taking on Virginia Beach Institute, had two touchdowns and a potential turnover called back in the first half due to untimely penalties. Bunn at Corinth Holders 7:30 p.m.
FOSTER’S FOREHAND. Bunn’s Ashley Foster executes a shot during last Thursday afternoon’s girls tennis showdown on the road against the Southern Nash Ladybirds. 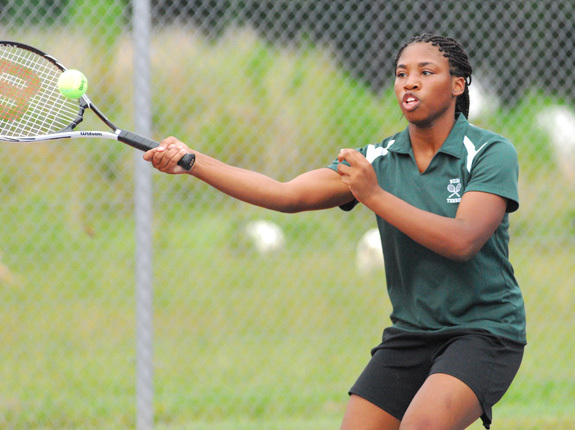 STANHOPE -- They might compete in different leagues, but Southern Nash and Bunn have enjoyed a solid rivalry in girls tennis action through the years. Of course, it doesn’t hurt that the schools are located about 10 minutes apart. Bunn made the trip to Stanhope last Thursday afternoon to continue the non-conference grudge match, and the result was a 6-3 victory in favor of the homestanding Ladybirds. MYRTLE BEACH, S.C. -- The Carolina Mudcats closed out the 2013 season with a 2-1 victory over the Myrtle Beach Pelicans on Monday evening at TicketReturn.com Field. The Pelicans (77-62) advanced on to play the Salem Red Sox in the Southern Division Championship Series of the Carolina League. The Mudcats finish the season 57-83. IT’S A FOOTRACE FOR LHS. 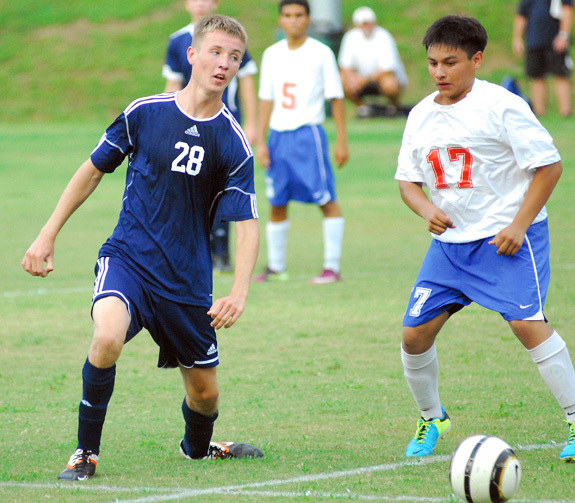 (L to R) Louisburg High School’s Daniel Calamaco tries to gain possession during Tuesday evening’s non-conference boys soccer matchup at Joyner Park. LOUISBURG -- Chris Cannady served as Louisburg High School’s co-coach during the 2012 boys season. Cannady is now the sole skipper for LHS this fall as the Warriors will look to replicate last year’s heroics, which featured a berth in the Class 2-A State Playoffs. The Warriors will be back in 1-A this fall under Cannady’s direction, and Louisburg is currently working its way through a tough early non-conference ledger. 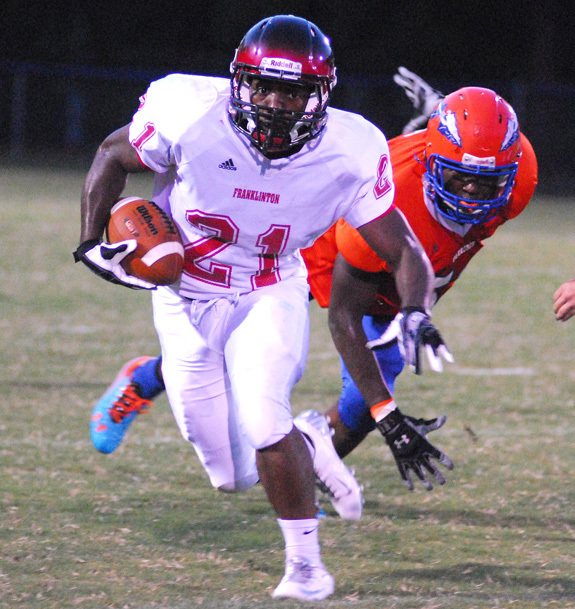 ROCKY MOUNT -- The annual Down East Viking Football Classic will be held Sept. 28 at the Rocky Mount Athletic Complex. The game will feature a duel between the Elizabeth City State University Vikings and the Fayetteville State University Broncos. LOUISBURG -- The Louisburg College Lady ‘Canes volleyball team opened up the 2013 season with a home, 3-0 win over Pitt CC, on Tuesday night. The Hurricanes came out firing as they dominated in the first game of the best-of-five match outscoring the Bulldogs 25-13. The second game of the match would be a little closer but LC was never threatened in the 25-20 win. GOING IN FOR THE KILL. 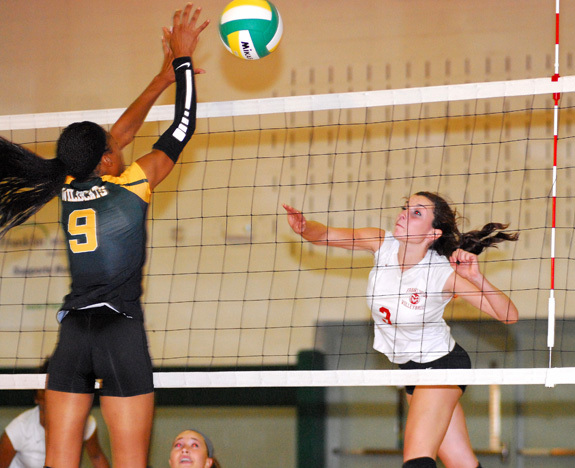 Bunn’s Tainasha Vines (left) soars for a kill attempt as Franklinton’s Mikaela Pulley (center) and Tiara Wilkins (right) defend during last Thursday’s prep volleyball contest. 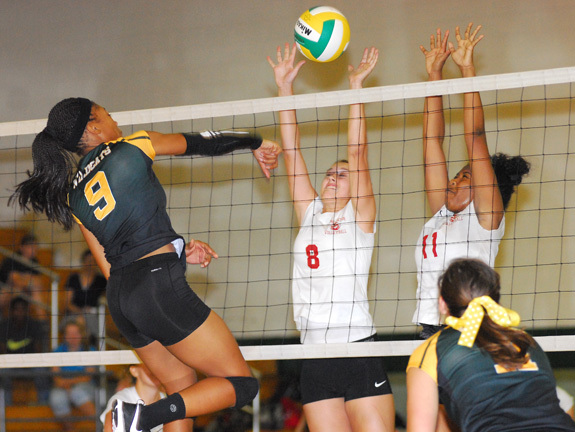 BUNN -- No team did a better job than Franklinton of limiting its damage against Tainasha Vines during the 2012 prep volleyball campaign. It wasn’t a coincidence that FHS was able to claim three victories over Vines and the Ladycats, even though Vines would eventually be saluted as the Northern Carolina Conference Player of the Year. LOUISBURG -- Coach Erica Wammock wondered how her young team -- with just one senior -- would respond during the early portion of Louisburg High School’s varsity volleyball schedule. Through five matches, the Lady Warriors have been strong with an unblemished 5-0 worksheet. Louisburg remained undefeated Tuesday with a three-game home victory against the Southern Nash Ladybirds, who are coached by former Bunn player Kandar Brewer. 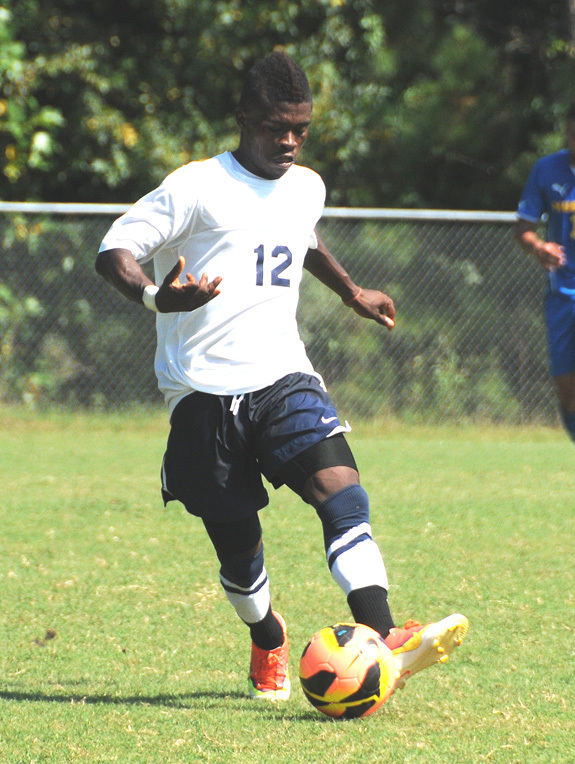 LOUISBURG -- The second-ranked Louisburg College men’s soccer team passed an early-season test as the Hurricanes knocked off #10 Monroe College, 2-1, in nonconference action last Friday evening at the Ronald May Soccer Complex. The Mustangs got on the board first as they opened up the scoring early in the first half. LOUISBURG -- Safe Space Inc. held its 12th Annual Golf Tournament on August 9 at the Green Hill Country Club in Louisburg. All proceeds from the tournament went to support the services of Safe Space Inc. a domestic violence services organization. ZEBULON -- The Carolina Mudcats have announced that pitcher Cody Anderson was named the 2013 Pitcher of the Year for the Carolina League. League managers, general managers and media voted for the year-end superlatives and honorary All-Star team. Franklinton’s Kaitlyn Branam (right) offered an effective outing for the Lady Rams during last Thursday’s road league event at Bunn High School. 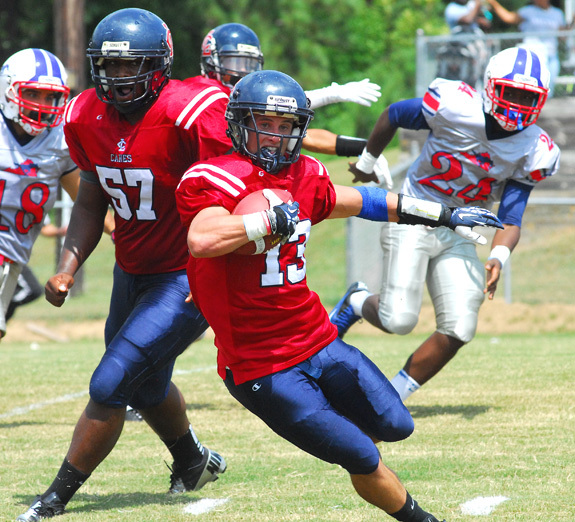 Virginia Beach Institute’s Ellis Richardson (left) is trailed by Louisburg College’s Bruce Walker during last Saturday’s football game, which was played at the Old Franklinton High School. 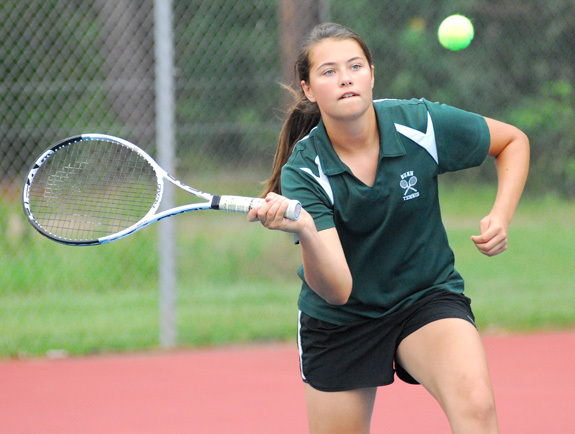 Bunn’s Charlotte Murphy prepares for a volley during last Thursday’s match at Southern Nash. 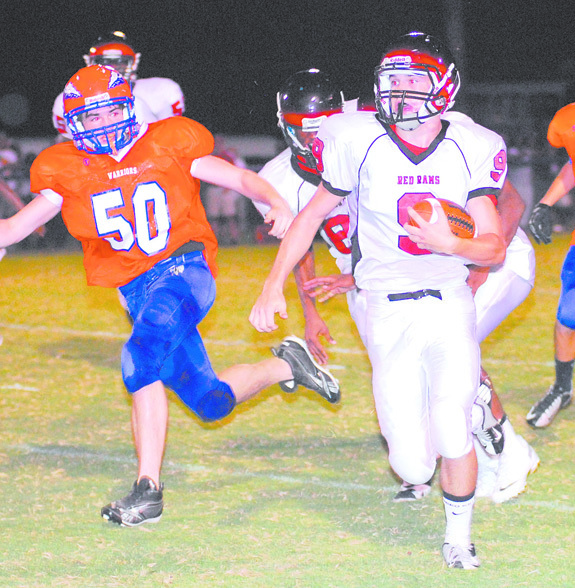 Franklinton’s Derryan Henderson (with ball) gains yardage for the Red Rams during last Friday night’s road gridiron victory over rival Louisburg High School at Patterson Field. 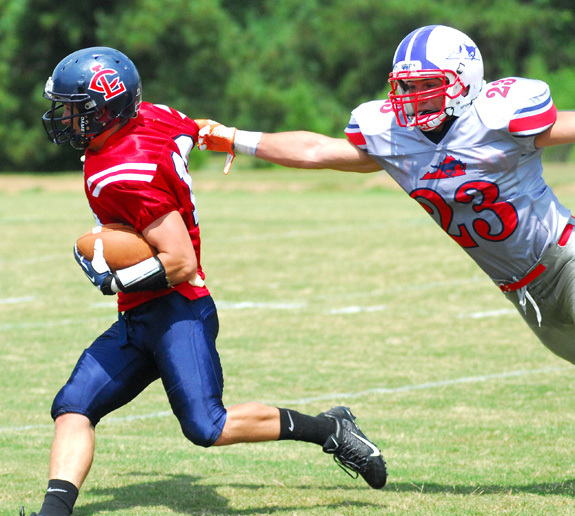 Louisburg College’s John Wheatley (left) escapes a tackle attempt during the Hurricanes’ season-opening football victory last Saturday against Virginia Beach Institute. 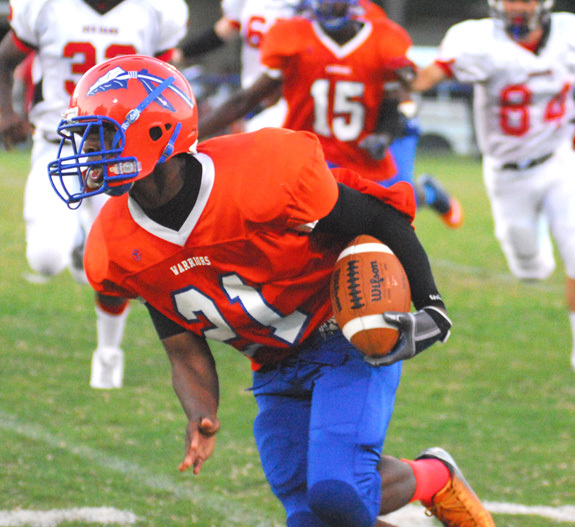 Louisburg’s Derrick Smith makes his way upfield for yardage during the Warriors’ home football setback last Friday night against the Franklinton Red Rams at LHS’ Patterson Field. 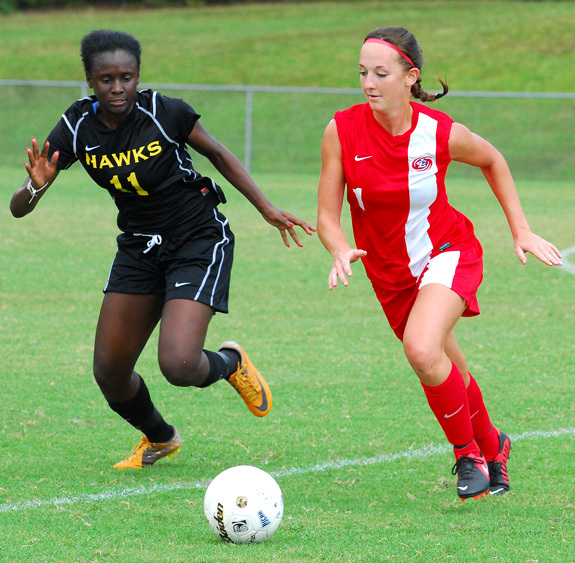 Louisburg College’s Jessie Scales (right) advances the ball versus Southern Maryland. 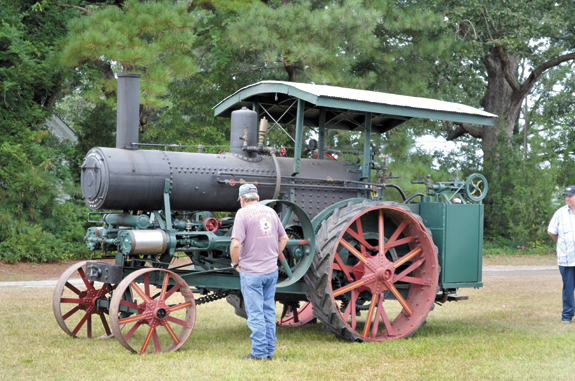 The 13th annual Justice Antique Tractor, Car and Engine Show gets started on Friday and runs through Saturday at the grounds of Duke Memorial Baptist Church on N.C. 581. Mr. and Mrs. Bruce D. Cheaves of Louisburg announce the engagement of their daughter, Nola Kimberly Cheaves, to Joshua Cleveland Gupton, son of Mr. and Mrs. Jimmie R. Gupton of Louisburg. 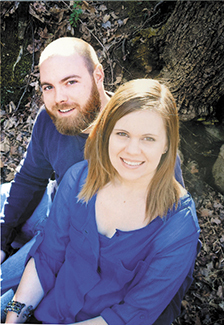 The couple will be married among their family and friends at Gambill Farm in Wilkes County, N.C. on Sept. 21, 2013. The N.C. Transportation Museum Foundation and the Watauga Valley Railroad Historical Society and Museum are again sponsoring Autumn Train Excursions, day trips by rail to two great destinations. This year’s excursions will return to some of the most popular past destinations. 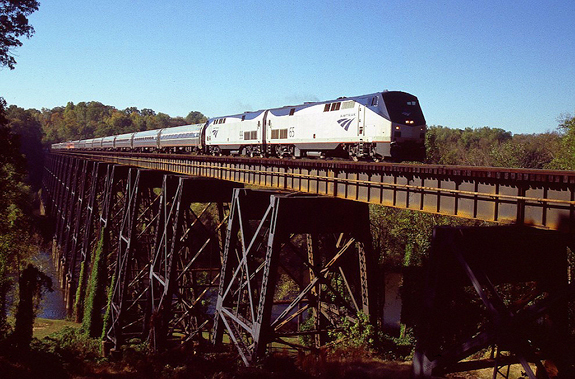 The “Virginia Autumn Special” departs for Charlottesville, Va., Saturday, Oct. 12. The “Blue Ridge Special” will head to Asheville, N.C., Sunday, Oct. 13. 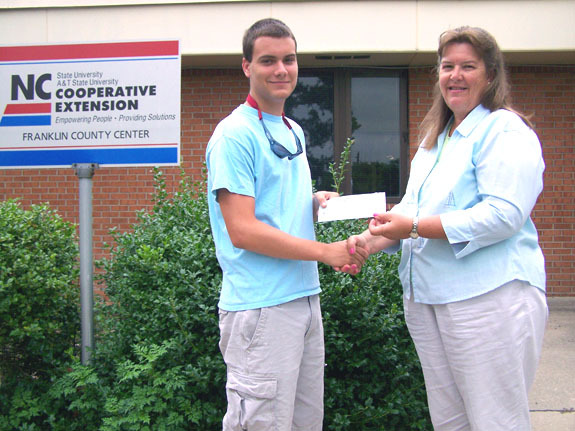 Louisburg High graduate Clayton Coley received the Franklin County Livestock Association’s scholarship for 2013-14. Clayton is attending NC State University. He is the son of Deborah and Francis Coley of Louisburg. The $500 scholarship will assist with tuition, books, and other needed supplies while studying for a Business degree. Making the presentation to Clayton is Martha L. Mobley, Agricultural Extension Agent, in Franklin County. The state has yet to announce any action it might take against Animal Control Director Taylor Bartholomew for violating the Animal Welfare Act by shooting and killing a dog at the shelter. And during the fallout, he has received death threats from as far away as Canada. On Tuesday night, though, he received nothing but support from those close to home. A Youngsville area man had his first appearance in court this week after a wreck on his scooter led to drug charges. The case against Michael A. Sills, 45, of Stephen Taylor Road, was continued until Nov. 25. Deputies charged him with possession with intent to sell and deliver crack cocaine, maintaining a vehicle for the sale of a controlled substance and felony possession of cocaine following a wreck on Aug. 24 that sent him to Franklin Medical Center. The Louisburg Lions Club has scheduled several lunch meetings begining this fall. The club normally meets the first and third Tuesdays each month at 6:30 p.m., but has decided to meet at noon on Sept. 17, Nov. 19, Feb. 18, and May 20. “We are anxious to try these new times to see if that works with schedules,” said Lions Club President Monty Riggs. Lt. Gov. Dan Forest has scheduled a Town Hall meeting in Franklin County next week. Forest is scheduled to be at the Hamilton Hobgood Courthouse Annex in downtown Louisburg on Sept. 9, beginning at 6 p.m. He is expected to provide a recap of the most recent General Assembly session and what is going on now, essentially providing a state of the state address.